How’s your spring cleaning going? 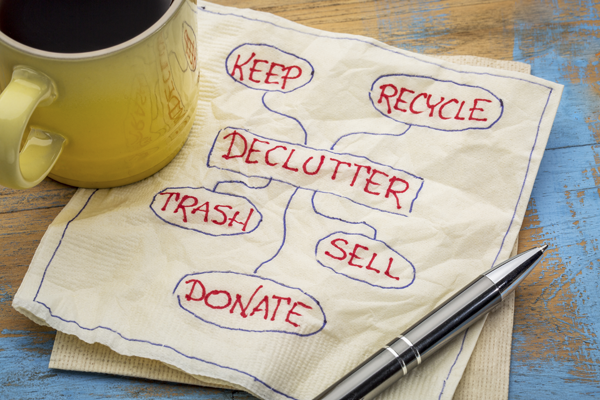 Are you decluttering, purging, simplifying or just wanting to downsize? Feeling overwhelmed? Have too much to do and not enough time? Here are some tips to help you get and stay organized without losing your mind! 1. Prioritizing your projects and Creating a Master Plan: I have been working with a number of clients in the past few months who want to declutter, purge, downsize or even move, and their biggest obstacle often is inertia due to feeling overwhelmed. That’s not necessary if you create both a Master Plan and prioritize your project list. 2. Donating to Goodwill through the Mail: Check out their Give Back Box program. Here’s how they explain it: Give Back Box® provides vendor services to retailers and charities, giving each and every cardboard box a second life to help people in need. Reuse your online shipping boxes in which you received your purchases, or any other cardboard box you may have, to donate your unwanted household items: such as gently used clothing, shoes etc., to make a major difference in the life of another person. I love this idea and it’s also a green solution! 3. Online options to sell and or pass on your discarded stuff: We are lucky that we have so many options to sell or give away our stuff. Here are just a few to check out: NextDoor, freecycle.org, Craigslist.org, the curb in front of your house, local recycling centers, eBay, Amazon, Facebook yard sales (yes, these are virtual), virtual estates sales, to just name a few. 4. Paperwork: If you are using paper folders, set up your 2017 folders for paid receipts.I do mine by the month. It’s simple, uses up less space and is easy to find what I am looking for quickly. You can also go digital; scanning only those receipts you really need – for appliances, medical expenses, home improvements, business expenses, and so on. Trust me, you do not need to hold onto every non-tax-deductible receipts for groceries, Starbucks and so on. Of course, there are certain documents you need to keep and should keep separately from your monthly documents, preferably in a safe-deposit box: such as tax returns, investment and retirement records, anything pertaining to property and valuables (including mortgages), and legal documents such as wills, birth, marriage and death certificates and so on. Your passport should also go in there, along with any other sensitive documents, such as your social security card, credit cards you don’t use regularly, and so on. 5. Autopay your monthly bills: If you don’t already use Autopay for paying your monthly bills, mortgage, utilities, etc., you should. It is easy to set up through your bank, it will help you avoid late fees, and best of all, help you cut down on paper receipts in your home office. 6. Keeping Organized: Set aside a regular time each week to keep your home office and desk organized. That includes purging of unnecessary mail, shredding bills you don’t need to keep, notes, post-its, and doing your filing regularly. Trust me on this one – you will thank me! And if you need some extra help and or support, just give me a call at (510) 710-3917. Let’s get you organized!